My my my, Mr. L.A., you stay one step ahead of the game. I just received an email from Talin Garabetian from HUSH. 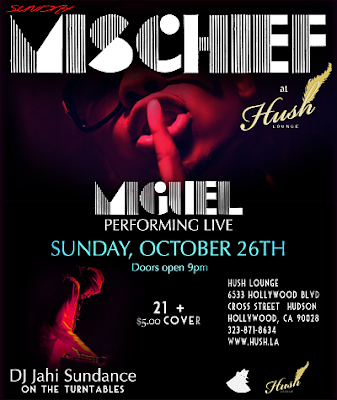 HUSH has a new promotion starting this Sunday called Sunday Mischief. Miguel will be performing live beginning at 9pm. There is a $5 cover charge. Unfortunately, the 1/2 off bottle service and $3 martinis was only for Prohibition Live Jazz Sundays. But don't let that stop your bottle poppin'. They have a really impressive bottle service menu.